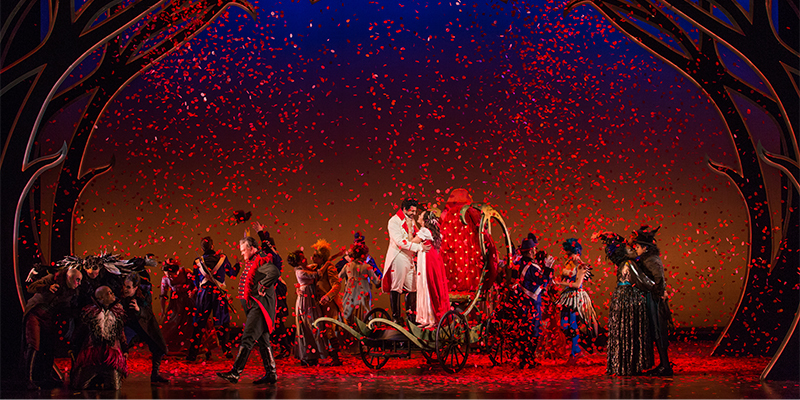 Madame Butterfly and Carousel both feature a Prince Less-than-Charming. For the creators, the male leads in the source material presented significant problems. Would Benjamin Franklin Pinkerton remain a one-dimensional representation of American imperialism? Would Billy Bigelow retain his cold shell, anger and shortsightedness? Would opera and musical comedy audiences be able to accept and understand these characters lying far from the archetypal male romantic lead? B.F. Pinkerton and Billy Bigelow both make impulsive decisions that have lifelong repercussions on the women who love them. Liliom, the play by Ferenc Molnár that inspired Carousel, ends with the main character Liliom (Billy’s equivalent) returning to Earth to do a good deed for his daughter and hitting her instead. In John Luther Long’s Madame Butterfly, Pinkerton treats his wife as an inanimate plaything, while in Belasco’s play, he has only a few lines. The solution to Pinkerton and Billy was in the music. 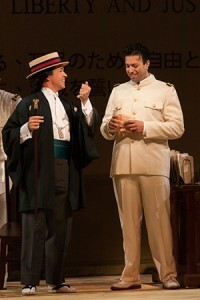 In earlier versions of Madame Butterfly, both Pinkerton and the American consul Sharpless were portrayed as racist imperialists, mocking Japanese culture and treating Pinkerton’s marriage to Cio-Cio-San as nothing more than a comedy. He reappeared only briefly near the end of the opera and the audience’s impression of him as a loathsome character remained. Throughout the writing process and the subsequent revisions of the opera, the role of Pinkerton deepened and softened. His racists remarks in Act I disappeared, and he took on the shape of a naïve naval officer dazzled by an exotic land and its unfamiliar customs, but Puccini refused to expand Pinkerton’s presence in Act III. He insisted that Cio-Cio-San should remain the focus of the tragedy. It wasn’t until after the opera’s disastrous premiere in 1904 that the composer took the advice of his librettists and publisher and wrote Pinkerton’s Act III aria “Addio, fiorito asil.” Returning to Japan three years later, Pinkerton discovers that Cio-Cio-San has given birth to his son, and he is forced to face the consequences of his youthful games. The damage cannot be reversed, but Pinkerton’s expression of remorse redeems him in the eyes of the audience. 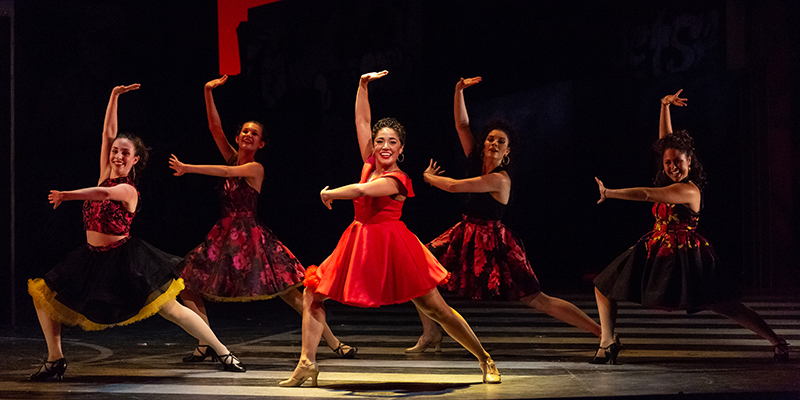 In contrast to Madame Butterfly, Carousel follows the arc of its male lead, Billy Bigelow. For Rodgers and Hammerstein, the success of Carousel hinged upon their ability to get the audience to sympathize with Billy, the carousel barker whose bite rivals his bark, “Suddenly, we got the notion for a soliloquy in which [Billy] would reveal his varied emotions about impending fatherhood,” Rodgers recalled in his autobiography Musical Stages. By having Billy express his excitement and anxiety over having a child in the famous “Soliloquy,” Rodgers and Hammerstein felt they had found a way to justify Billy’s actions. At the end of the “Soliloquy,” Billy, determined to provide for his child, resolves to commit a robbery. The robbery is botched and rather than go to jail, Billy kills himself, leaving a devastated Julie to care for their unborn alone. Even in the afterlife, Billy remains stubborn and refuses to admit any wrongdoing. When given the opportunity to return to Earth and help his now teenage daughter, an outcast who shares her father’s passion and quick temper, he strikes her in frustration. Julie rushes to confront the strange man who has hit her daughter, and just as Pinkerton sings an aria of remorse, the ghost of Billy sings of his regret in the reprise of “If I Loved You.” In a moment of simple genius, Hammerstein changed the phrase “I’d let my golden chances pass me by,” to “I let my golden chances pass me by.” Billy, at last, recognizes and admits the pain he has caused. 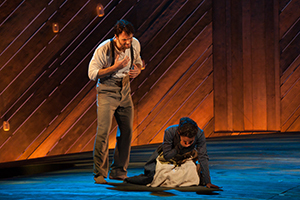 Throughout Carousel, Billy’s actions are a continued source of controversy and debate. He, like Pinkerton, is not a character that is easily understood, and his actions are difficult to fully justify, but in providing Billy with a motive and in having him recognize his errors, Rodgers and Hammerstein created one of the most complex and human characters in the Broadway canon. In the many past performances of Butterfly I’ve seen, always I have left with the impression that Pinkerton is a miserable American SOB. This performance at Glimmer- glass is the first I’ve seen where I saw Pinkerton in an entirely different light. He realizes that he has made a great error for which he has and shows great remorse. 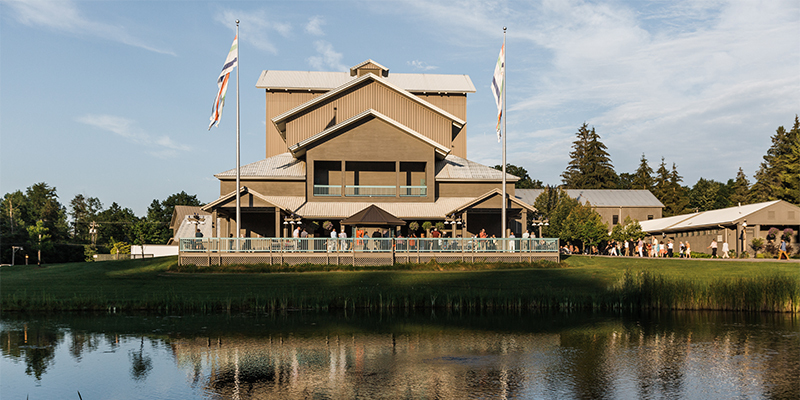 I must have seen at least 20 live productions of Butterfly, none has been more moving than this one at Glimmerglass.